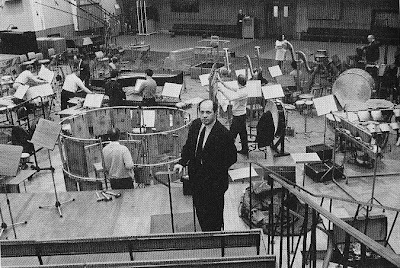 The photo above shows Pierre Boulez at a rehearsal for his Pli selon pli before the first complete London performance in May 1969. The rehearsal took place in the BBC's Maida Vale Studio 1, and last week came the news that this historic studio complex is to be sold as part of the current BBC cost cutting measures. 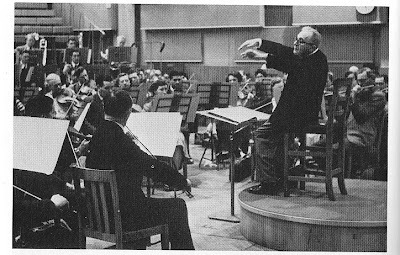 The BBC Symphony Orchestra moved to Maida Vale in 1934 when it outgrew the concert hall in Broadcasting House. The Maida Vale building was a disused roller-skating rink in west London, and it was converted into five purpose-built studios. The largest, used by the BBC Symphony and seen in the three photographs here, has a capacity of 220,000 cubic feet, and can accomodate a small audience. It has hosted many famous musicians, including Bruno Walter who is seen below conducting a rehearsal there in 1955. Boulez and Walter were just two of the international musicians who worked at Maida Vale. But Studio 1 has a particularly important place in the history of British music, and was used for rehearsals and broadcasts of many important contemporary works. 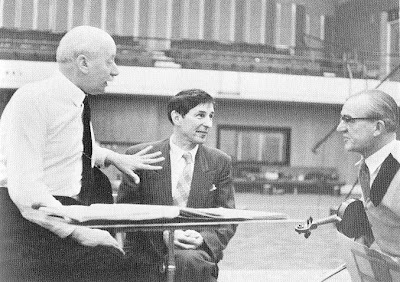 The photograph below shows Sir Adrian Boult with Michael Tippett and BBC Symphony leader Paul Beard at a rehearsal for the premiere of the composer's Second Symphony in February 1958. At the subsequent performance the orchestra's string section lost its way in the complex opening passage, and the self-effacing Boult restarted the performance after blaming himself for the breakdown. The final fate of the BBC studios at Maida Vale is not clear at this time, but reports have stated that it is to be sold to raise money, together with the BBC's TV Centre. It is very regrettable that such an important facility may be lost in order to support the annual £540,000 ($1m) that the BBC's top presenters are reported to be earning for a daily three hour show. Now read about the Lucaskirche studio in Dresden that has hosted many famous recordings including Karajan's Die Meistersinger von Nurnberg. Although the acoustic of studio 1, is not the finest, the Maida Vale site includes at least 4 other studios. Studio 2, the second largest, has been partially mothballed for several years now – only being used for choir rehearsals despite being an extremely good acoustic space. Unfortunately studio 1 underwent extensive renovation comparatively recently, which included the installation of a new Studer digital console (costing in the region of £500 000) in the newly refurbished control room. The studios have been under regular threat of closure by BBC management: the building is in need of constant maintenance and due to its location in a residential area there are limits to the hours of operation and access. In July 2007 the BBC announced that the studios were "wholly unsuitable for the 21st century", and it was reported that it would be sold to property developers as part of cost-cutting measures. However, no viable alternatives have been found to house Maida Vale's various activities, and as of October 2009 the studios are still in constant use.